Use for feedlot beef cattle. Contains Optaflexx™ brand of Ractopamine HCL. For increased rate of weight gain, improved feed efficiency and increased carcass leanness in cattle fed in confinement for slaughter during the last 28 to 42 days on feed. 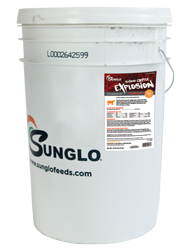 Each pound of Show Cattle Explosion™ supplement contains 573 mg of Ractopamine HCL. Show Cattle Explosion™ supplement. This will supply 90 – 430 mg/head/day of Ractopamine HCL. Caution: Not for use in animals intended for breeding. Limitations for use: Feed continuously to cattle as sole ration for the last 28-42 days on feed.